Experience the convenience, elegance, luxury & contemporary chic, command brightness or darkness at the touch of a button... 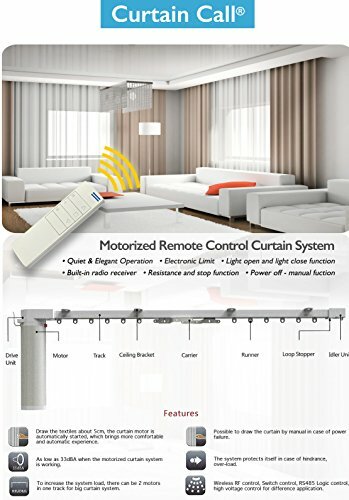 This commercial quality motorized drapery system is ultra-quiet & sturdy, adds distinction & "wow factor" to any residential or corporate space, even as complement for your home theater. Additional cost applies for ripplefold conversion. Copy & paste this link to view demo: www.youtube.com/watch?v=b2QXcIT6r5A Track length is available between 3 - 36 feet, please see other listings for the track size needed.. Once your order is placed, PLEASE email us to SPECIFY YOUR TRACK LENGTH required for the installation space, with leeway for both ends, for comfortable mounting. Motor hides behind drapery; this listing is for Center Open orientation. Check our listings for One Way Pull. Motor hides behind drapery; Assembly & installation are easy & fun! Operated with either a RF Remote Control Unit, optional Wireless Wall Control, or even manually. INCLUDING: • Motorized non-retractable straight track system with Curtain Runners & accessories. • Ultra-quiet motor w/ Universal Adaptor 100V - 240V, detects & sets soft starting & ending points of drapery movement. Settings will be saved even after power loss. The motor stops in case of resistance or overloading. • 1-Channel RF Remote Control - No need to aim at the system, operation range 50 feet. • Mounting Brackets For Dual-Track System, if there's sheer behind drapery, simply purchase qty 2 and have them mounted front and back. The 3-Channel Remote Control operates them individually or/and simultaneously as you like y first select the channel# on the Remote Control. OPTIONAL • 3, 7, 9 or 16 -Channel Remote Control • Wireless Wall Control (1 or 2 channels) • Timer Control • Curved track & other unique applications also available Please contact us for more details. If you have any questions about this product by Curtain Call, contact us by completing and submitting the form below. If you are looking for a specif part number, please include it with your message.